This is a fantastic opportunity. 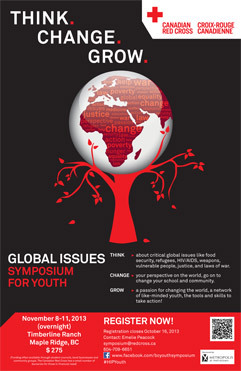 Students will learn about in depth global issues, meet other students from across the Lower Mainland. Horatio Alger Association of Canada opens scholarship application process -Students in Quebec, Ontario, Alberta and British Columbia invited to apply- (MONTREAL, QUEBEC, October 1, 2017) - With students back in class, the Horatio Alger Association of Canada today announced the opening of its scholarship application process for students beginning their post-secondary studies in the fall of 2017. High school students residing in Quebec and Ontario, and – for the first time – in Alberta and British Columbia, are encouraged to apply today through December 1st. The scholarships can be used for both post-secondary vocational or university studies and in Quebec, for either CEGEP or university studies. A total of 80 need-based scholarships (20 per province) of $5,000 are available each year. The application form can be found on the Association’s new website at http://www.horatioalger.ca. Location Westview Safeway. Please come and see Mr. Olson for more information. DECEMBER 14th - Lonsdale Corridor Christmas Dinner - Dinner will be served for the homeless and those trapped in the Poverty Cycle. Mr. Olson is looking for volunteers - parents welcome! Please see Mr. Olson if you are interested in volunteering.